UPDATE: Ahmad Khan Rahami was taken into custody in Linden, N.J. Monday morning. A massive manhunt was launched and millions of New York City-area residents were alerted directly after police identified a suspect in connection with the Chelsea bombing that injured 29 people. 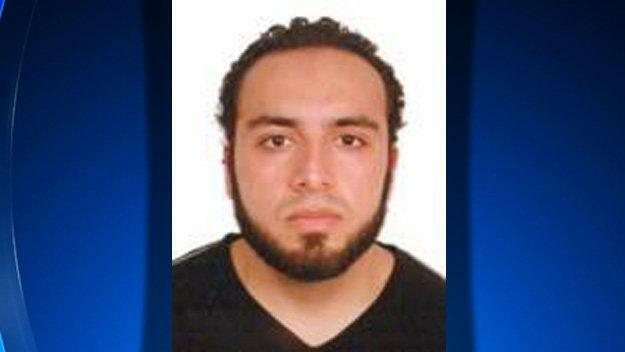 Ahmad Khan Rahami, 28, is being sought in connection to the Saturday evening explosion in Manhattan’s Chelsea neighborhood, officials in New York, New Jersey, and with the FBI said early Monday. In addition to Rahami, CBS News security analyst Fran Townsend reports two others were seen in surveillance tape handling explosives but it is unclear if they played any role in the attack. Cellphone users across the tri-state area were alerted to the suspect’s name and description around 8 a.m. with a system normally reserved for flash flood warnings and Amber alerts. In New York City, police officers were being held over from previous shifts. The city has already been on heightened security as world leaders arrive this week for the United Nations General Assembly. Officials say surveillance video places Rahami at the scene of both the bomb that exploded in Chelsea, as well as the one that failed to explode and was taken away by police. Sources tell CBS News that Rahami is also sought in connection with the bombing in Seaside Park, New Jersey, as well as the five explosive devices found in a backpack near a train station in Elizabeth, New Jersey, the suspect’s hometown. De Blasio said Monday that there is “not enough information” to say if Rahami was acting alone or if others were involved with the incident, adding that the investigation is ongoing. Early Monday, FBI agents swarmed an apartment above a fried chicken restaurant in Elizabeth that’s tied to Rahami. The activity came hours after one of five devices found at the nearby Elizabeth train station exploded while a bomb squad robot attempted to disarm it. Officials had been seeking a connection between the string of attacks that started Saturday and unfolded in a short time span. The first attack happened at a road race to benefit Marines and sailors at the Jersey Shore at 9:30 a.m. Saturday. The race had been scheduled to start shortly before the blast occurred, but was delayed due to the large numbers of people registering for the race and reports of an unattended backpack being found. Officials noted that if the race had started on time, a “good number of people” would have been running past the area where the explosion occurred. The device used was described as a pipe bomb set off with a cellphone trigger. The second attack happened Saturday night at around 8:30 p.m. in New York City’s bustling Chelsea neighborhood, known for its vibrant nightlife. While 29 people were injured in the blast, none were hurt seriously and all were released from the hospital within 24 hours. Officials say the device used was a pressure cooker bomb also set off by a cellphone trigger. A second, very similar device was discovered later just a few blocks away and was removed before it could be set off. The bomb that rocked the bustling Manhattan neighborhood contained residue of Tannerite, an explosive often used for target practice that can be picked up in many sporting goods stores, a federal law enforcement official said Sunday. However, no Tannerite residue was identified in the New Jersey bomb remnants, in which a black powder was detected, said an official who spoke to The Associated Press on condition of anonymity because the official was not authorized to comment on an ongoing investigation. A source tells CBS News three cellphones with the two New York devices and one associated with the Seaside Park device are described as flip phones. Officials haven’t revealed any details about the makeup of the pressure-cooker device, except to say it had wires and a cellphone attached to it. In Elizabeth, New Jersey, the last known address for the Rahami, Mayor Christian Bollwage said after five more pipe bombs were discovered near a train station around 8:30 p.m. Sunday evening that he didn’t believe his town had been deliberately targeted. Bollwage said it was possible that someone worried about the authorities was trying to get rid of the package. “I’m extremely concerned for the residents of the community, but more importantly extremely concerned for everyone in the state and country where someone can just go and drop a backpack into a garbage can that has multiple explosives in it with no timers and then you have to wonder how many people could have been hurt,” Bollwage said.